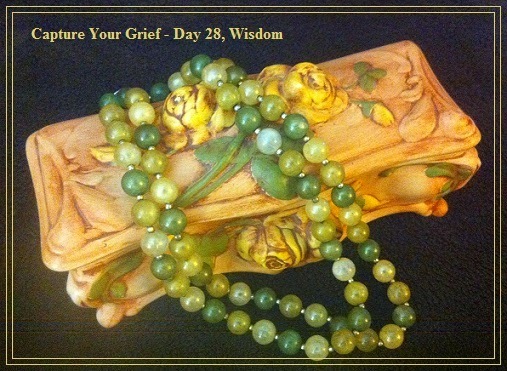 Wisdom…that is today’s Capture Your Grief prompt. One thing I have learned in the few years I have been on this earth, is to glean wisdom from as many places and people as possible. I constantly do my best to seek wisdom from my elders on earth. I have learned a great many things from doing that alone for the past number of years. I have been blessed to be able to do so. I now look back at all the scenarios surrounding losing Faith with many feelings and emotions. I continue to wish that I had the knowledge and wisdom then to know more about what was going on. Somehow, I just feel if that were the case, that Faith would be with us today. While I cannot dread and be stuck in the past, I can, however, move forward and gain as much knowledge and WISDOM about as many things in life as possible. Along with that, I must make it my business to share with others the knowledge and wisdom that I gain through my experiences and my education. Who among you is wise and understanding? Let him show by his good behavior his deeds in the gentleness of wisdom. 14 But if you have bitter jealousy and selfish ambition in your heart, do not be arrogant and so lie against the truth. 15 This wisdom is not that which comes down from above, but is earthly, natural, demonic. 16 For where jealousy and selfish ambition exist, there is disorder and every evil thing. 17 But the wisdom from above is first pure, then peaceable, gentle, reasonable, full of mercy and good fruits, unwavering, without hypocrisy. 18 And the seed whose fruit is righteousness is sown in peace by those who make peace. This verse really speaks to me about life in general. Wisdom sure seems to be something that makes life good and full of peace. I will always miss Faith, but I must gain wisdom from my experience and share that love, knowledge and wisdom with others. For my picture today, I am using a picture of my jewelry box that used to be my Grandma’s as well as a necklace that used to be hers. I still glean wisdom from her somehow from Heaven. Where do you search for wisdom?